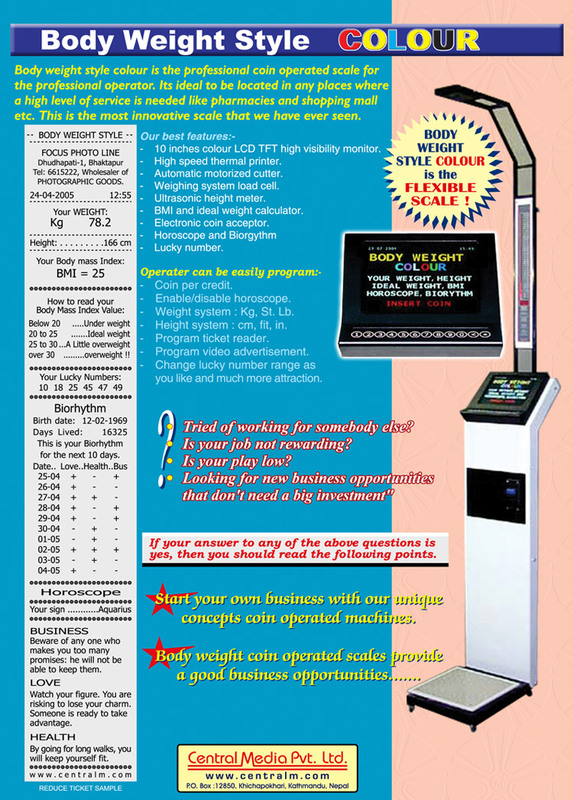 Our Products - Body Weight Machine Sales and Distribution in Nepal : Central Media Pvt. Ltd.
Start your own business with our coin operated machines. Is your job not rewarding? Looking for new business opportunities that don't need a big investment? If your answer to any of the above questions is yes, then you should read the following lines. 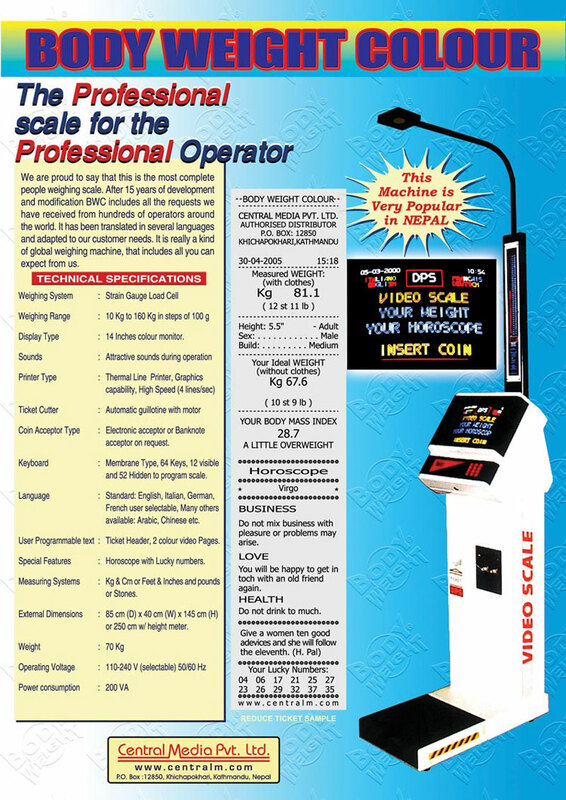 We manufacture coin operated machines and our machines are special. Why? They are evergreens, they are not designed to be a short term fashionable item. We have learned how to design something that always appeals to people, in most countries, because even is in this globalize world, luckily there are still different views of what is life and what is fun. Our machines are family oriented, that means we offer some type of 'sound' attraction that appeals to mothers and kids as well. We also deals amusement gambling machines or video games. We make machines that provide a service that is welcome by most people. We make Weighing-Scales (but if you are interested we also make Horoscopes, Fortune Tellers, Skill Testers...) machines where everybody would put a coin to try at least once. If this sample interesting for you, don't hesitate to contact us. We will be glad to provide any further information. We are proud to say that this is the most professional and attractive people weight height & fortune teller machine never seen before. With more than 21 years experience in this field, we have engineered the new BWC, called BWC II, including all the requests received from hundreds of professional operators around the globe. I hope we did a great job for our loyal operators. This machine, as usual, has been translated in several languages and adapted to customer's future needs. 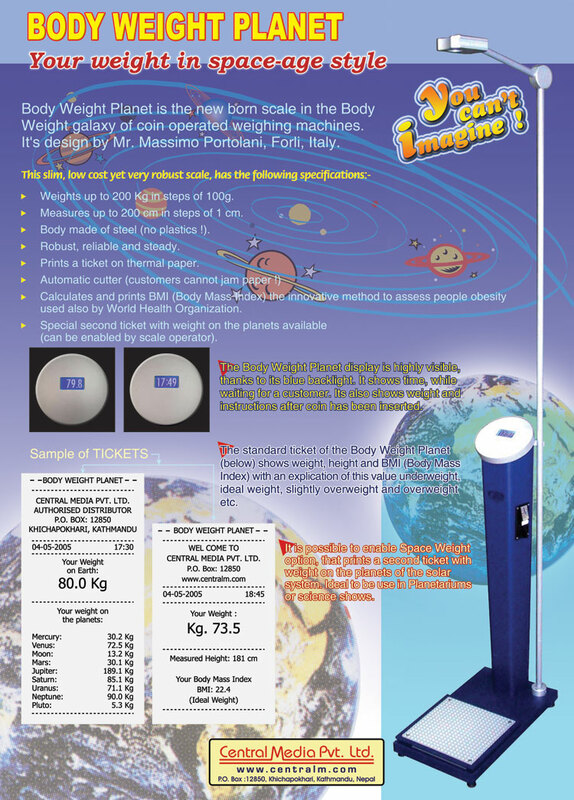 Its really a kinds of popular weighing & fortune teller machine that includes all you can except from a Body Weight product! Click here to read pdf to know more about the product.